The fire is dying down; you'd better put another log on it. The drunk man just lay on the sidewalk, like a log. The captain's log showed that the ship had encountered pirates, but fought them off. It is important to log any accidents that occur in the workplace. Those trees are going to be logged in the spring. ants on a log: a popular children’s food: a piece of celery with peanut butter or cream cheese spread on the top and raisins placed on top of the peanut butter. See how it looks! log cabin: a house (usually old-fashioned) made of logs. Check it out on Wikipedia. -log- comes from Greek, where it has the meaning ‘speak; word; speech.” While it is completely unrelated to the English word log, this meaning is found in many English words, such as: analog, apology, chronology, decalogue, dialogue, doxology, epilogue, eulogy, ideology, logarithm, logic, logo, monologue, neologism, philology, syllogism, tautology, terminology. 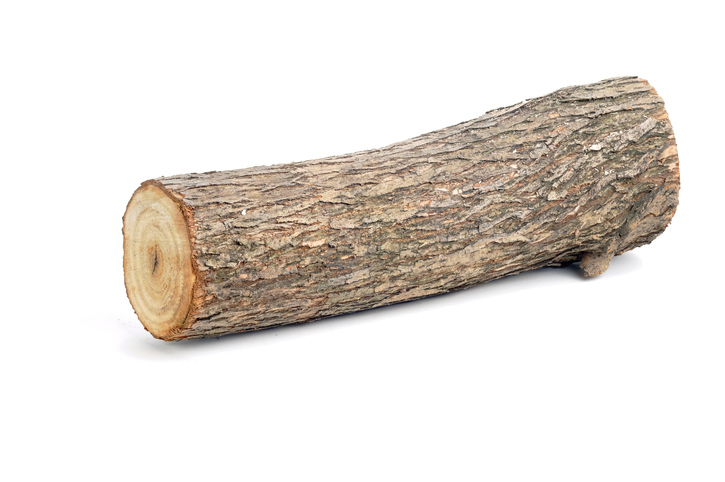 The noun log, meaning ‘large piece of tree,’ dates back to the mid-14th century, as the Middle English logge. It was a variant of lugge (pole, limb of tree), but the origin is uncertain. It is probably related to the Old Norse lag (felled tree), but some linguists actually think its origin is different: the expression of something very large with an appropriate sound, and could be related to clog (which as we saw before, originally meant lump of wood). Log, meaning a record of activities, dates back to the 19th century, and is a shortened form of ‘log-book’ (which dates back to the 17th century), a term used by sailors. It was called a log book because it recorded speed measurements that were made using the weighted chip of a tree log on the end of a log line with knots. The sailors counted how long the line took to stretch out in the water, and the knots on the rope are the reason speed at sea is still measured in units called knots. The verb log (to fell a tree) comes from the noun and first appeared in the early 18th century, while the verb meaning ‘to record something’ comes from the other meaning of the noun, and dates back to the 19th century.